Yeesh. I wanted a week between the last post and this one, not a month. Once again, I’m too busy doing stuff to write about the stuff I’m doing. Oh well. After Tokyo and Nikkō, I spent a day in Kamakura. Kamakura – a 45-minute train ride down the coast from Tokyo – was the capital of the Kamakura Shogunate (1185-1333). This was the first shogunate, and it displaced the imperial court as the center of power in Japan. But rather than constituting a new government, the shogunate was more like a new layer of government. The emperor had unassailable legitimacy, so although everyone knew how things really stood, the court continued on in Kyoto until the Meiji Restoration. 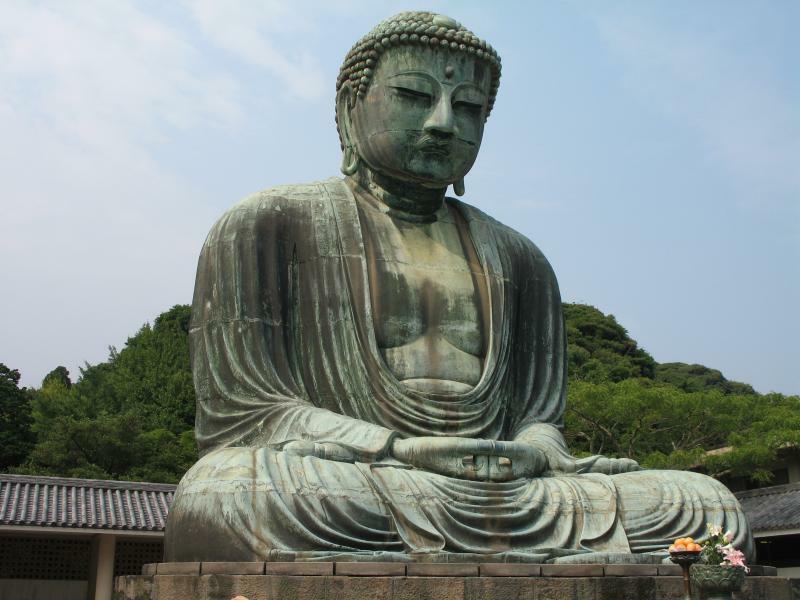 Today, Kamakura is probably most famous for its giant statue of Buddha. When the statue was built in 1252, it was inside a temple, but a couple centuries later a typhoon swept away the building and it’s been in the open ever since. 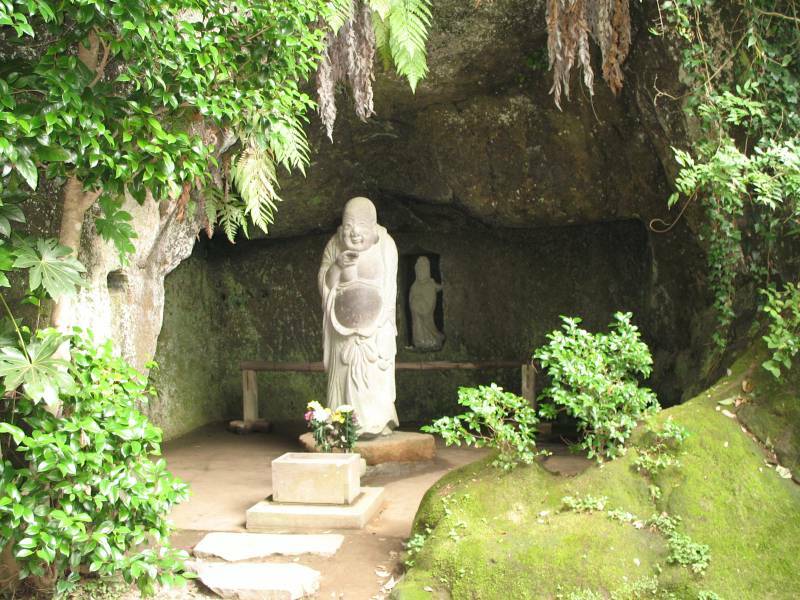 In addition to the Daibutsu (“Great Buddha”), Kamakura is known for its Zen temples. 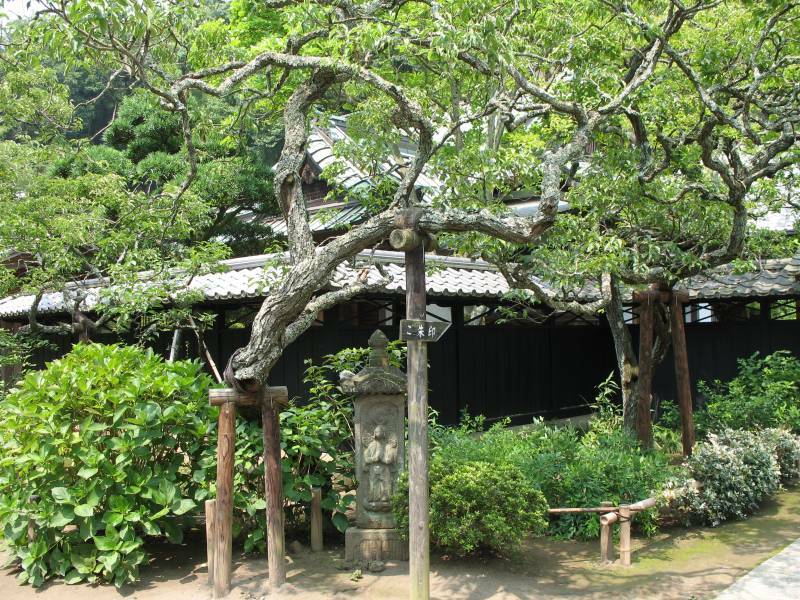 Zen entered Japan around the beginning of the Kamakura period and quickly became popular with samurai, thus many temples were founded in Kamakura. 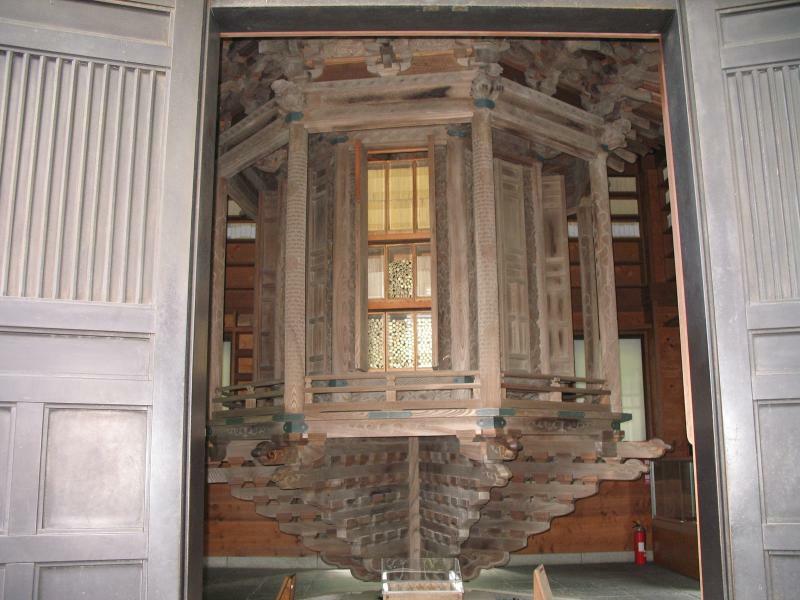 It was a sanctuary for abused women from its founding in 1285 until the Meiji Restoration. During this period, women couldn’t initiate divorces, but the temple enjoyed extraterritoriality and any woman who stayed there for three years was granted a divorce. Another temple, Jōchi-ji, was heavily damaged in the Great Kantō Earthquake of 1923, and it’s buildings have been rebuilt in the past couple years. The contrast between the fresh wood of the new buildings and the temple’s relics is as sharp as that of the new and old tatami in this picture. Wow, that was a spectacularly awkward analogy. But let’s not dwell on my bad writing! Here’s another picture from the same temple. This statue is of Hotei, one of the “Seven Gods of Fortune.” He represents abundance and contentment. Outside of Japan, he is depicted as a fat, laughing Buddha – based on an actual Chinese monk who lived in the early 10th century – and is regarded as an emanation of Maitreya (the Future Buddha predicted to renew Buddhism after it disappears from the world). 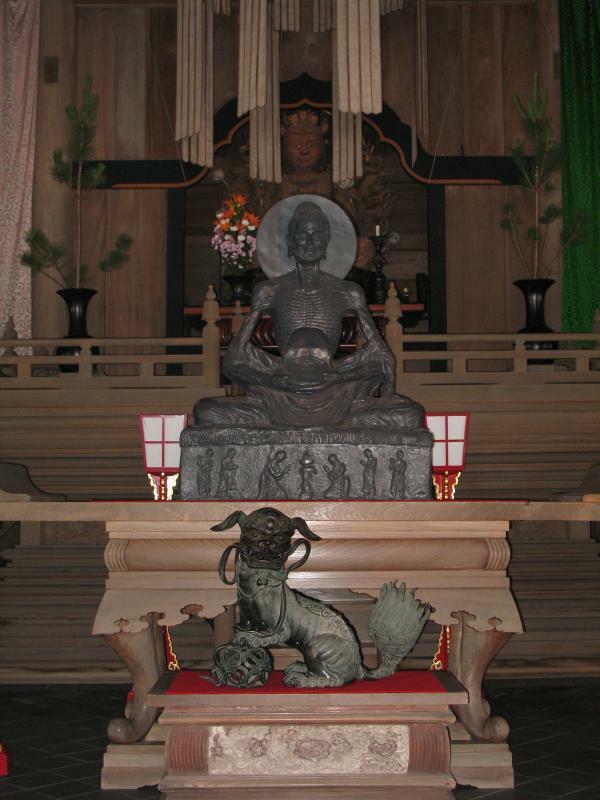 Kamakura’s biggest temple, Kenchō-ji, received this statue as a gift from Pakistan. 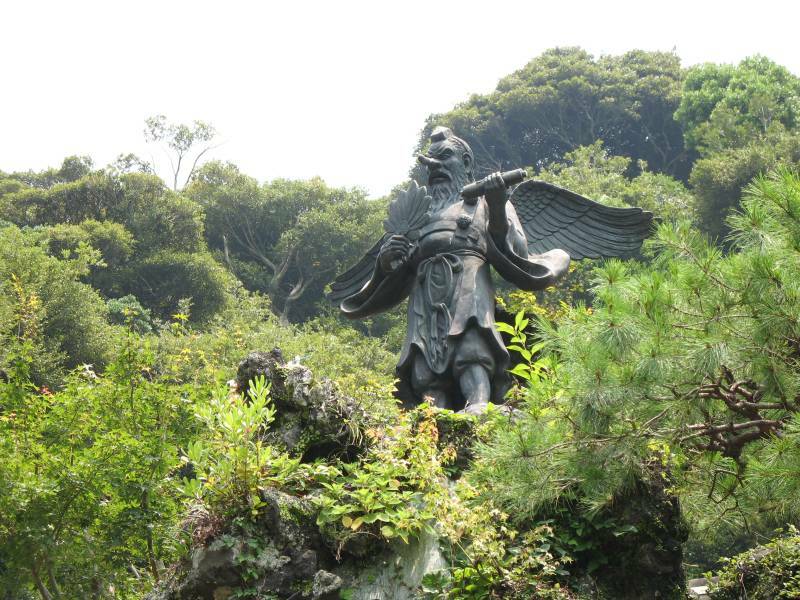 And rounding out my pictures of statues, this is one of many tengu on the steep hill/mountainside at a shrine dedicated to protecting Kenchō-ji from fire. I was surprised to see them, because in stories, tengu often delight in using their magic to trick monks. But although they’re dangerous and fond of mischief, tengu aren’t necessarily evil, and since they’re protectors of mountains, I guess it makes sense to want them on your side. One last picture before I finally put this post up. 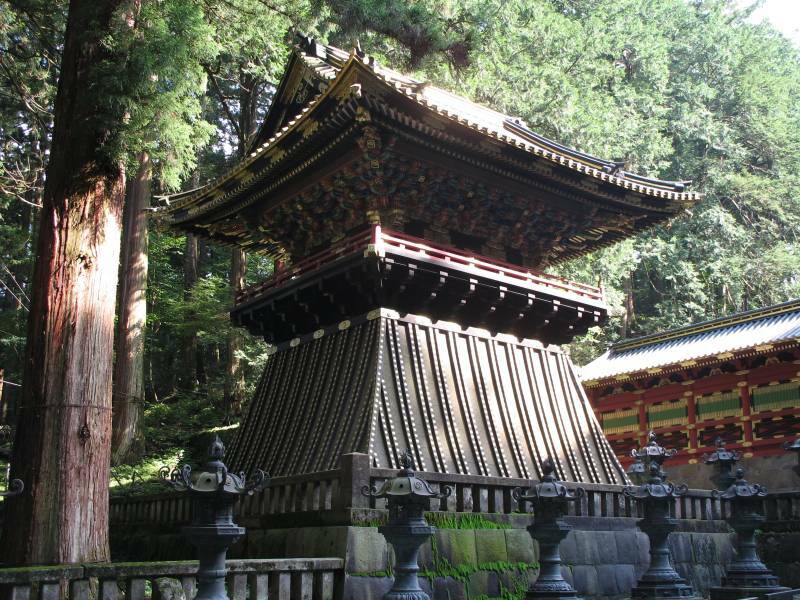 This is a revolving sutra repository at Hase-dera. Even literate Japanese adults can’t read sutras without extensive study, so turning this repository lets you read them symbolically. Right. I said I’d talk about Yasukuni Shrine. Yasukuni was built by imperial decree in 1869, to honor/enshrine those who died in the short civil war of the year before which had ended the Shogunate and restored direct imperial rule (the Meiji Restoration). It later became the shrine for all those who died in service of the nation. Today, whenever a Japanese prime minister visits Yasukuni, protests arise throughout east and southeast Asia, particularly in Korea and China. But what’s the big deal? A nation should be able to honor its fallen soldiers, right? The US, for example, has Arlington National Cemetery and numerous war-related monuments, after all. Part of the outrage comes from the fact that Class A war criminals are included among the enshrined. They weren’t included initially, since they hadn’t died in action, but when the government put them on the registry of war dead so that their families could receive pensions, Yasukuni used this as grounds to enshrine them. In and of itself, that’s still defensible, however the war criminals were enshrined as “Martyrs of Showa” (Showa being the name of Emperor Hirohito’s reign). So the real issue isn’t that war criminals are enshrined at Yasukuni, but that the shrine is saying that they were in the right. This leads to the other source of controversy: Yasukuni’s war museum. In addition to displaying letters, pictures, and personal affects of soldiers, the museum covers Japan’s military history, focusing on the modern era, from the Meiji Restoration to World War II. It presents Japan’s military actions of this period as a matter of defending itself and the rest of Asia from Western aggression. Korea was annexed for its own good and the invasion of China was somehow inevitable. The text books used in history instruction at intermediate schools from the 1997 school year will contain material on the subject of comfort women. The textbooks depict as a historical fact the story of Asian women who were forced into prostitution by the Japanese Army. Imparting this story to students who are still young and immature has become a great problem since last year. This matter is drawn upon the judgment professed by the Military Tribunal for the Far East that Japan fought a war of aggression. Can we say that this view is correct? [. . .] We cannot help but feel that the possibility of ulterior motives have not been discounted. Isn’t it a fact that the West with its military power invaded and ruled over much of Asia and Africa and that this was the start of East-West relations? There is no uncertainty in history. Japan’s dream of building a Great East Asia was necessitated by history and it was sought after by the countries of Asia. We cannot overlook the intent of those who wish to tarnish the good name of the noble souls of Yasukuni. Meanwhile, after the “Martyrs of Showa” were enshrined there hasn’t been a single imperial visit to Yasukuni. That’s gotta sting. And that’s the basic background. This has nothing to do with anything, but here’s another picture from Nikkō. 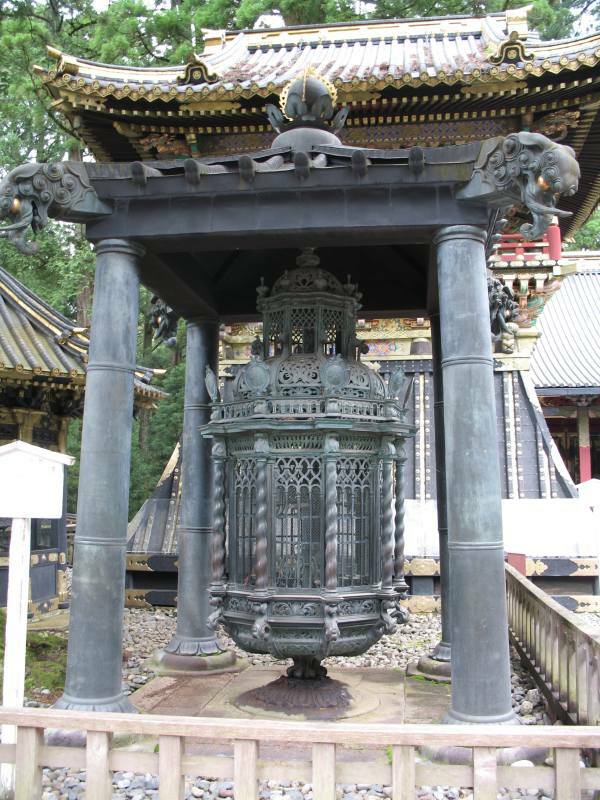 This huge lantern in Tōshō-gū is decorated with baku, mythical creatures that eat bad dreams. 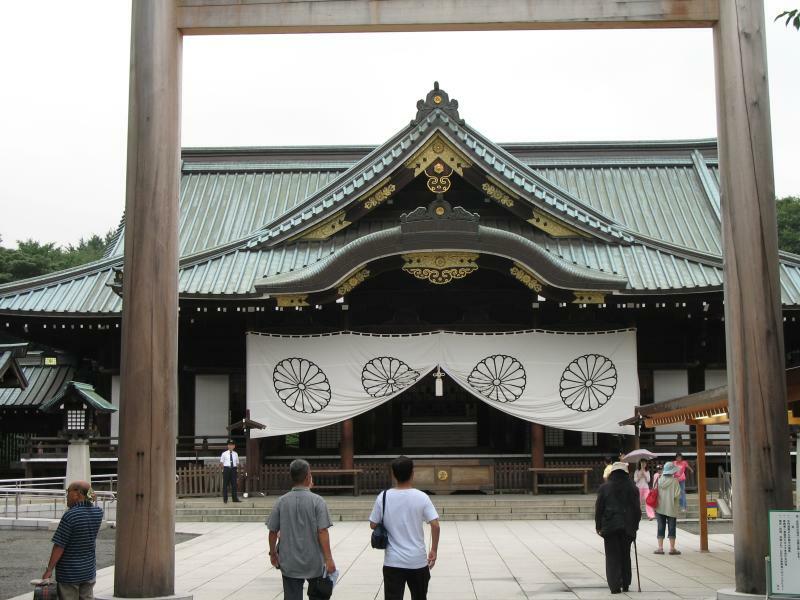 So what’s the deal with Yasukuni Shrine being so nationalistic when the Emperor himself is much more moderate? Basically, Yasukuni retains the State Shinto ideology. State Shinto’s creation following the Meiji Restoration involved sharply separating Shinto from Buddhism, organizing the nation’s shrines into an ordered hierarchy, and shaping the varied and amorphous beliefs and practices of Shinto into a national religion centered around emperor worship and serving the empire. State Shinto was abolished after the war and old shrines at least partly reverted to their traditional identities, but aside from the removal of emperor worship, Yasukuni’s identity pretty much is State Shinto. With a view to pursuing the end of warfare, establishing global peace and world prosperity and contributing to the welfare of humanity, we seek to provide relief and assistance to the families of those who died in the War. In pursuit of the establishment of a peaceful Japan, the cultivation of character, and the promotion of morality, we seek to praise eirei [“heroic spirits,” i.e. the kami of soldiers], to promote the welfare of the families of the war dead, and to seek recognition and compensation for civilian auxiliary units. So goals of world peace are dropped and instead they talk about morals and praising eirei. And that’s the sort of thing you hear from the people who demand that Japanese textbooks teach students patriotism and not “fabrications” like comfort women, the Nanking Massacre, and so on. After visiting Tokyo, I spent two days in the town of Nikkō. Lying in the mountains north of Tokyo, two hours away by express train, Nikkō is famous as the location of Tōshō-gū, the shrine of Tokugawa Ieyasu. Tokugawa Ieyasu reunified Japan in 1600, ending the warring states period and creating the Tokugawa Shogunate, which lasted until 1868. Ieyasu asked that upon his death, a small shrine would be built in Nikkō where he would be enshrined as the nation’s guardian kami. 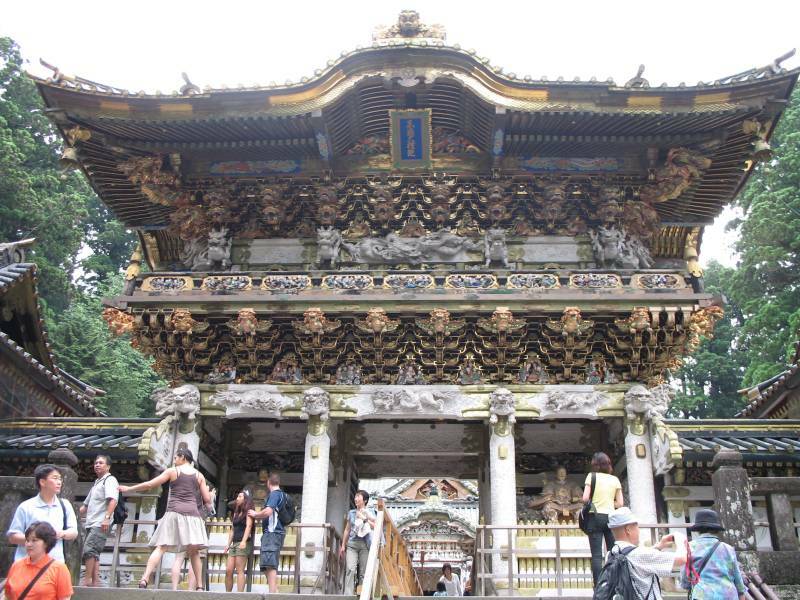 His will was honored, but the 3rd Tokugawa Shogun, who idolized Ieyasu, had the modest shrine converted into the over-the-top buildings that remain today. This gate is looking a bit faded, but the almost excessively ornate construction – over 500 sculptures on this gate alone – gives a good idea of the aesthetic of the shrine. This pagoda, meanwhile, has been given a fresh coat of paint. 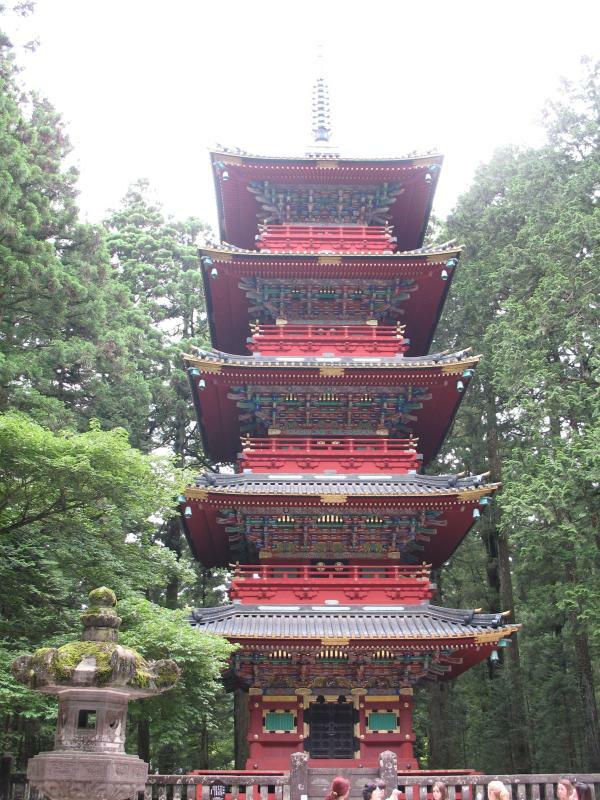 Pagodas are usually associated with Buddhist temples, not Shinto shrines, but the distinction is blurred in Nikkō. Granted, the two institutions were often intertwined before the Shogunate fell and the new government decided to “purify” Shinto of foreign influences, but the mix is quite striking in this case. 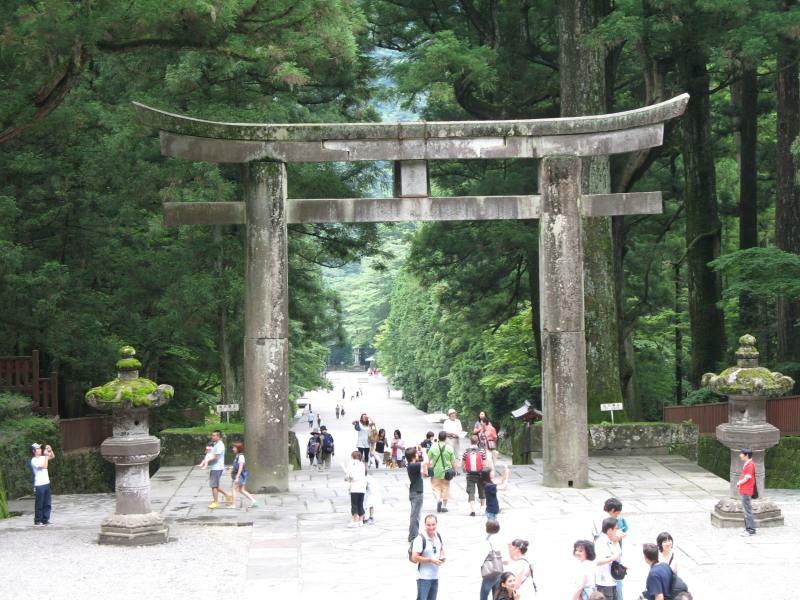 There is a Shinto gate . . .
. . . and the surroundings are appropriately forested, but otherwise the complex doesn’t look very shrine-like. Breaking from the monumental . . . 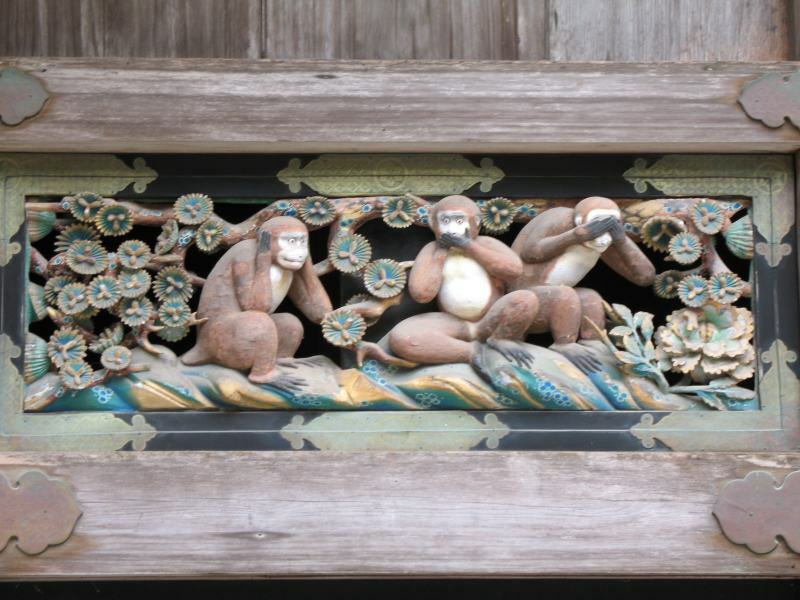 If not for the crowds of people snapping pictures, one might not notice the carvings adorning the shrine’s stable, but these are the original See/Speak/Hear-No-Evil monkeys. This is a play on words, by the way, since the Japanese phrase (which is much older than the imagery) uses an archaic negative suffix, “zaru,” and the word for monkey is “saru.” I’ve known this bit of trivia for a couple years, but what I didn’t know until I saw them is that the 3 Monkeys form just one scene in a series of panels depicting a life cycle. 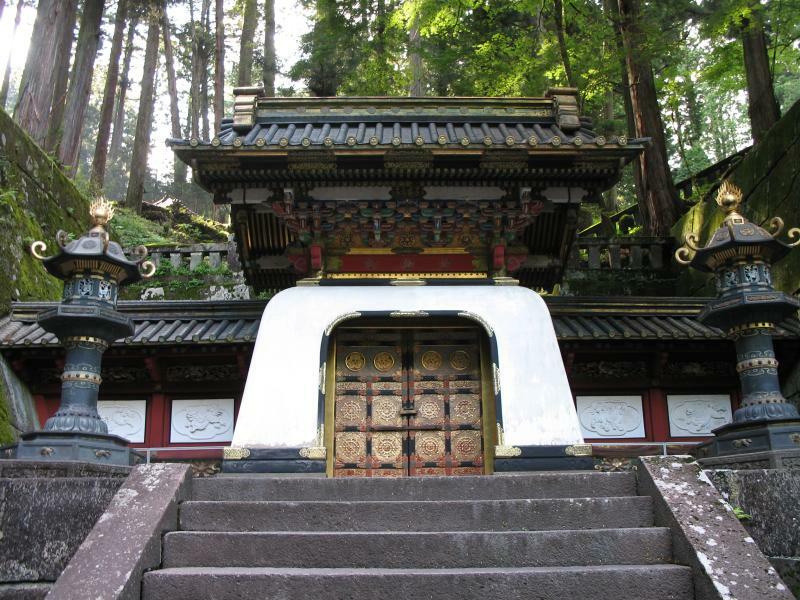 A short distance from Ieyasu’s shrine is Taiyū-in, a shrine the 3rd Shogun commissioned for himself. Past its outer gates, it’s intentionally more subdued than Ieyasu’s, as you can see with this drum tower. 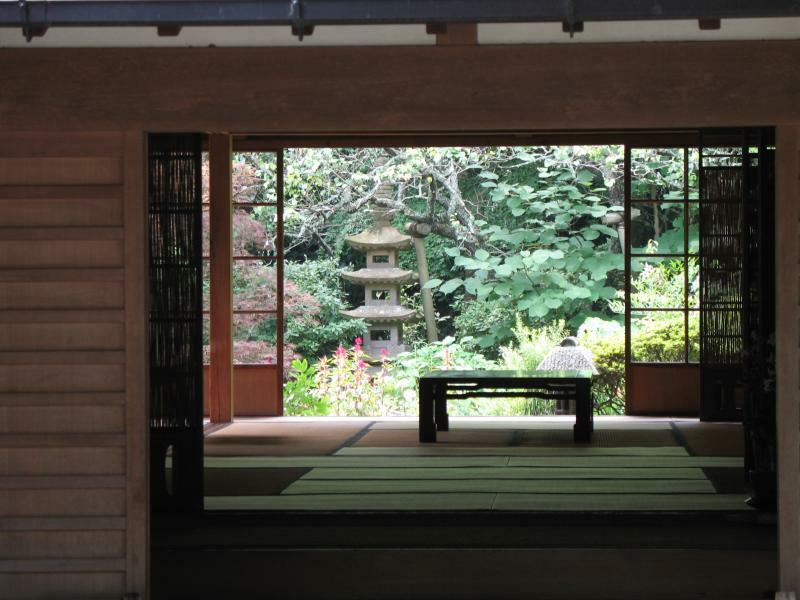 But while Taiyū-in isn’t as overwhelming, just as much craft went into its construction. 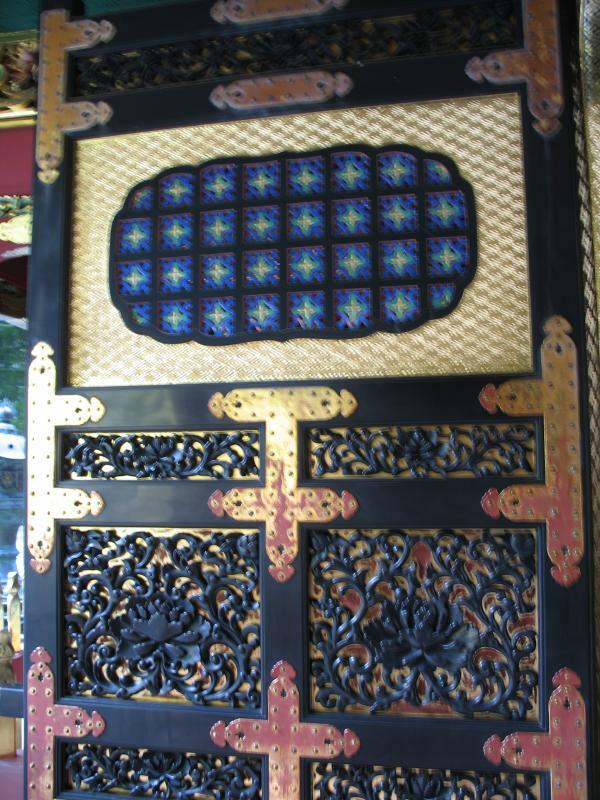 This door belongs to what is commonly called the Peony Gate. And this is nicknamed the Dragon Palace Gate. The inner shrine lies beyond, but it’s not open to the public. 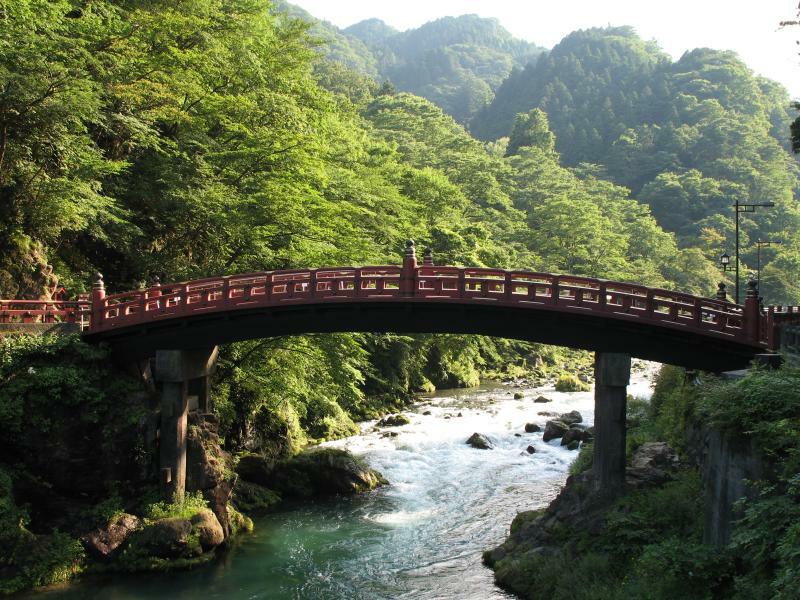 Although it’s been rebuilt numerous times, this bridge dates to Nikkō’s founding, a thousand years before the shrines made the town famous. Picturesque, eh? While the town itself isn’t particularly attractive, the surroundings are gorgeous. The temperature is also much cooler than in Tokyo, which was very welcome. 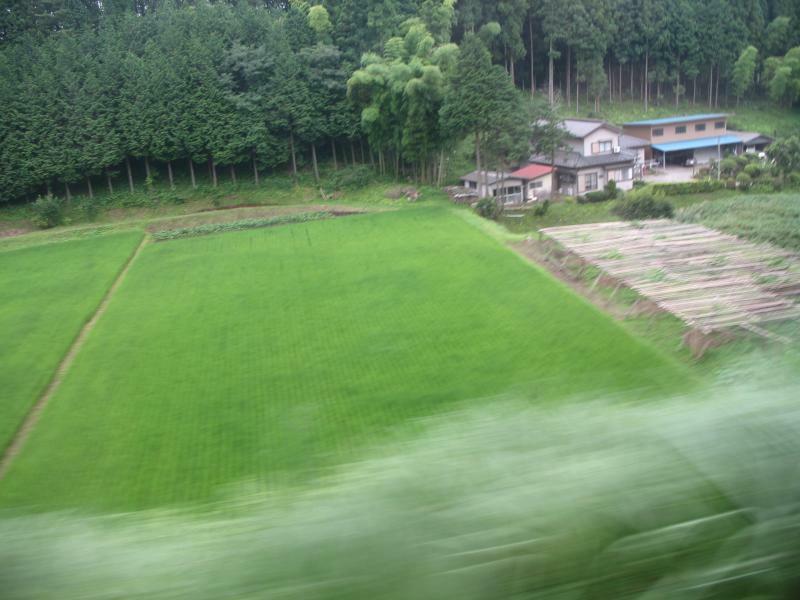 But alas, my two days in Nikkō were quickly over and I was soon on a train speeding back to sweatier climes. You are currently browsing the Erratic Dispatches blog archives for October, 2007.